So, another one - Brussels! I can't go that day !!!! Just bought 2 tickets for this concert! Don't worry about it. I would react the same way if it was me. Hmm, in fact I can't go. 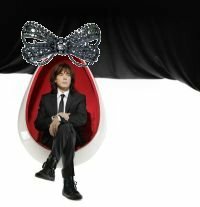 It's 2nd Easter Day, so expect a ribbon around the egg on stage. Jones you fool! I was drinking a mouthful of coffee up to the point where I read your comment and now I'm in need of a dry cleaner!! It would be nice there is a Cadburyâ€™s CrÃ¨me Egg on the fanâ€™s seats individually, for everyone to have. Just as long as you are aware and not too excited to forget and sit on it. That's a very pretty bow, Dr_Jones.